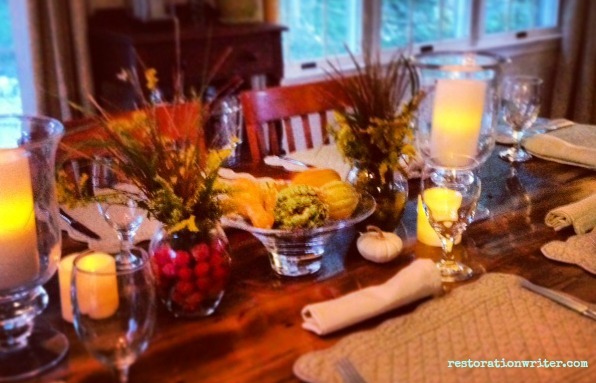 Coming up with a fall centerpiece for your kitchen or dining table doesn’t have to be expensive or complicated. Look at it as an opportunity to showcase some of your favorite things and to let your own sense of style shine through. 1. 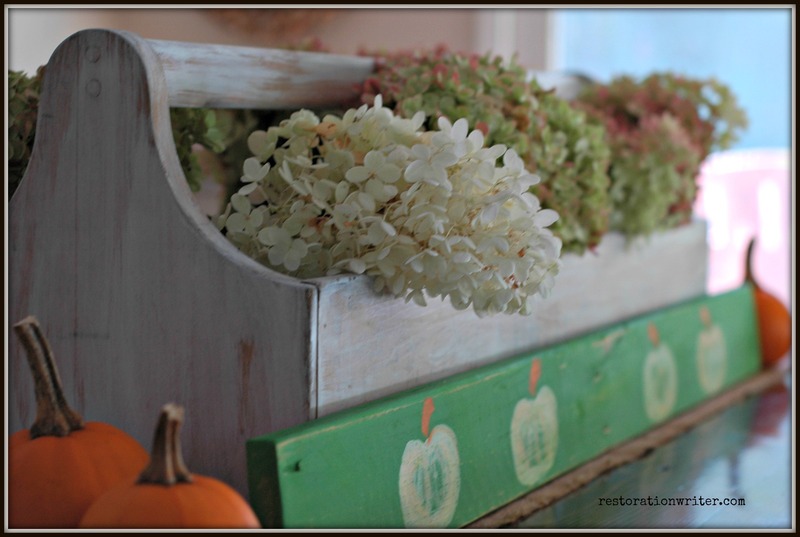 Hydrangea: Hands down my favorite flower to decorate with. 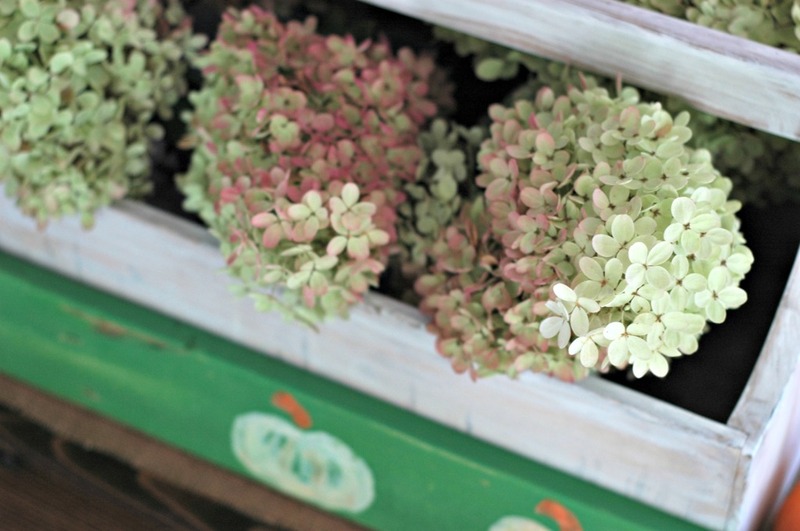 At the end of every summer, I pick armloads of hydrangea to dry for use over the winter. When the blooms are picked at the peak of color and left to dry (as they are doing here), they make a great arrangement in a vase throughout the long, dreaded months without blooming hydrangea. 2. Antique Tool Box: I bought this antique tool box for $20 at an antiques warehouse in New Bedford, Mass. To make it my own, I applied a quick whitewash to the wood and felt pads to the bottoms of the metal claw feet so they wouldn’t scratch my tabletop. 3. 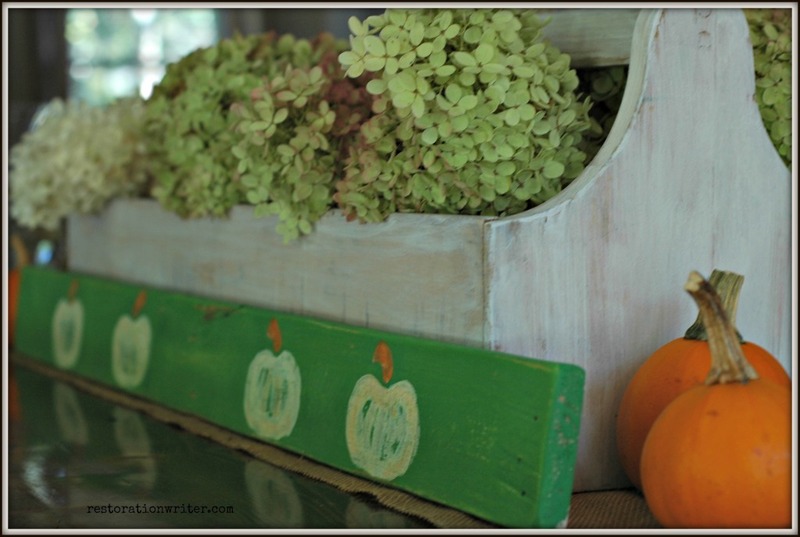 Pallet Board Pumpkin Sign: This is a plank from a pallet. I cleaned the board and sanded the rough edges before painting it with leftover paint from another project. Once dry, I used white and orange acrylic paint to add a few whimsical pumpkins. After all of the paint had dried, I took a sanding sponge over the entire board to distress the paint. 4. Pumpkins: This year in particular, there are many variations of pumpkins available but sometimes a few traditional pumpkins do the trick. No reason to over think this one unless you want to! 5. Burlap Runner: Burlap is available at any fabric store for a few dollars a yard and the uses are endless! I cut this piece of burlap months ago to serve as a rough runner for my table and I love it so much that it is pretty much a mainstay at this point. You may remember it from my Easter table last spring. 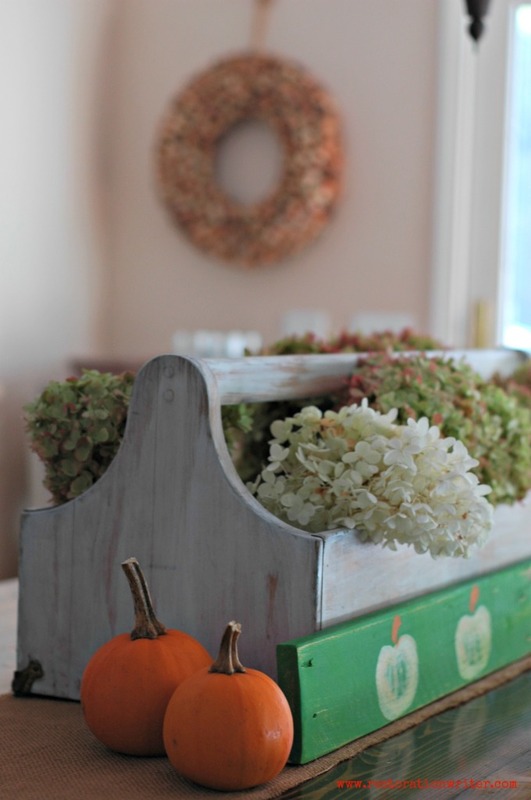 What do you think of this fall centerpiece? What is on your table this fall?